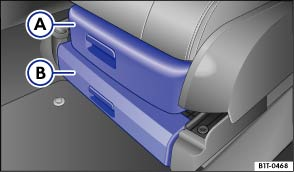 A drawer Ⓐ and stowage compartment Ⓑ may be located under each of the front seats. A first-aid set or fire extinguisher can be stored in the stowage compartment. To open press the button in the drawer grip and open the drawer. To close push the drawer in as far as it will go under the front seat. To open, fold the cover forwards. To close, push the cover upwards. An open drawer or an open stowage compartment can impair operation of the pedals by the driver. This could result in serious injury and accidents. Always keep the drawer and stowage compartment closed while the vehicle is in motion. Otherwise, the drawer, the cover of the stowage compartment or other items could fall into the driver footwell and obstruct the pedals.